On 30 November 2016, Metropolitan Hilarion of Volokolamsk, chairman of the Moscow Patriarchate’s Department for External Church Relations, visited the Embassy of the Republic of Cuba in Moscow and met with Ambassador Emilio Losada Garcia to express condolences over the death of Fidel Castro Ruz. The DECR chairman noted that there was no single man in Russia who did not know the name of this man. Indeed, friendship between our nations and the Russian people’s respect for the Cuban people are linked with the years when every Soviet citizen knew the name of Fidel Castro. Metropolitan Hilarion added that His Holiness Patriarch Kirill feels special feelings to Cuba as he visited the island many times and met with Fidel Castro. The construction of a Russian Orthodox church in the centre of Cuba’s capital was completed with personal participation of Fidel Castro. Ambassador Garcia thanked the DECR chairman for his kind warm words and assured him that the Cuban leaders would continue to strengthen friendly relations and develop fruitful cooperation between the Russian Orthodox Church and Cuba’s government. Fidel Castro Ruz, 90, died on November 25, 2016. Nine days of mourning were declared. 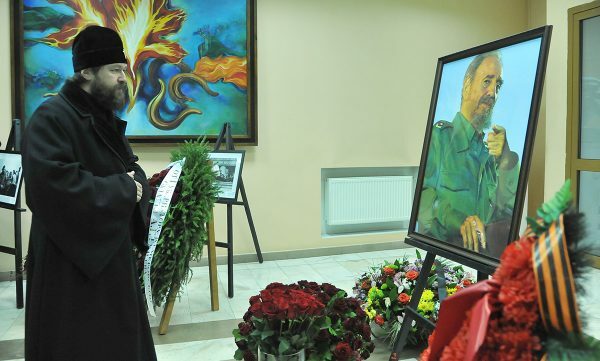 He will be buried in Santiago de Cuba on December 4.